Well here we are for my fourth installment of Year of the Cupcake for my 101 Things list, and it's going swimmingly. I had originally intended to make some sort of pumpkin-based cupcakes for Hallowe'en and had even purchased Hallowe'en-themed cupcake liners and sprinkles (by which I mean things in purple, black, orange and green with some cute little spooky sprinkles), but then I a) ran out of time and b) felt a bit funny about making Hallowe'en-themed anything when I don't actually celebrate it myself on account of it being an American thing and I'm an Australian, damnit! You know, for a second there when I was writing the title, I thought it odd that the title in the recipe book was "short-black". I never thought that there was a hyphen. And then I wrote it without the hyphen, and realised that it could be read as "short, black" and although short, these cupcakes aren't black. They're brown. And they're tasty. And the icing will have you bouncing off the ceiling. HOORAY FOR CAFFEINE!!! They're from the below book, which is the book that first got me hooked on Donna Hay. It sat there, beckoning to me as I walked into my first ever Borders Store and the presentation grabbed me immediately. So cute! Such amazing photos! I was in heaven - a combination of books (and LOTS OF THEM!!! ), and cooking. Sadly, Borders is no more. But Donna Hay lives on! I have since bought or begged all the other books in the series. And you know what? Given her food styling abilities (or perhaps the abilities of her food stylers and photographers?? Who knows...), I wouldn't be at all surprised if she was at least partially responsible for inspiring the food blogging craze. The timeline fits, as does the styling and photography and the fact she obviously publishes her recipes for an international audience (cups AND grams AND alternative names for things). Just a thought. Also, does anyone know whether I could get my arsed kicked for re-publishing Donna's recipes on my lowly blog? I always make an effort to tell everyone how awesome the book the recipe is from is, so surely I'm recommending the purchase of her products and not detracting from her sales?? Aaaanyway, I made these for my friend Jody's kitchen tea, along with the chocolate brownies I will shortly post a recipe for.﻿ Sorry the photos are so bad, but they were taken with the camera on my phone, which has no luvz for taking close-ups. 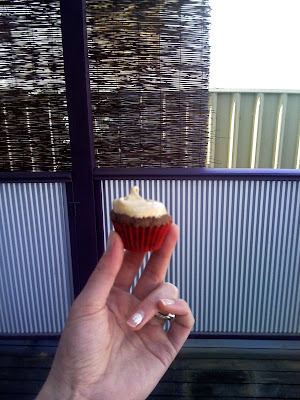 As you'll notice, I took the cupcake photo at arm's length and the damned thing STILL focused on the mini-orb on my verandah, dangit. Also, I don't know why I keep writing "photos" (plural) when I only took one and stole the other. And I took only one because I knew there was no point bothering with such a cruddy camera. Heat oven to 160oC (140oC F/F). Put mini muffin wrappers in 4 x 12-hole mini muffin tins (I used 1 x 24 and then made 6 larger cupcakes to feed friends who were coming over before the kitchen tea). Cream butter and sugar until light and fluffy. Add eggs one at a time and beat well. Sift over the flour and cocoa and beat until combined, then add the milk and keep going until that's combined, too. Meanwhile, melt the chocolate. You know, if you're that coordinated. If not, having the batter sitting there while you sort yourself out probably isn't a big deal. Once melted, stir through the batter. Transfer into mini muffin tins (I found that each took a little over 1/2tbsp of mixture). Refrain from licking the bowl until you really have scraped as much as you can from it. Bake for 10-12 minutes or until cooked when tested with a skewer. Cool on wire racks and then ice. Place sugar, water, cream of tartar and coffee in saucepan over high heat and stir until the sugar is dissolved. Bring to boil, reduce the heat to low and simmer for 3 minutes. Place egg whites in the bowl of an electric mixer and beat until soft peaks form. With the motor running, gradually add the sugar mixture and beat until thick and glossy. Spread over the cupcakes. 1. 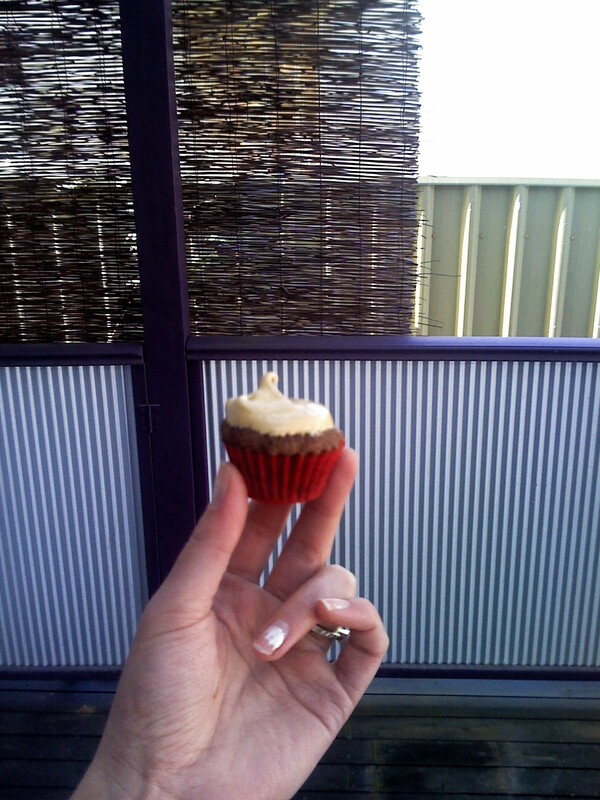 The texture of the cupcakes is odd. Good, but odd. I don't know whether I overcooked them, but when I first bit into them they seemed a little dry and crumbly... BUT THEN! Then, they melted in my mouth. I'm serious. It was just so light and it literally dissolved. Soooo gooood. So don't let that freak you out. 2. The sugar syrup seems to take on a life of its own once it is heated, I guess because the sugar holds the heat well. Mine just kept bubbling away off the heat, which made me concerned I was going to end up with toffee and not a nice soft ball syrup (which I assume is what this recipe was angling for). So keep an eye on it! 3. I really ought to moisturise my hands and remove my scrappy nail polish before taking photos of them and posting them online! Pity I don't like cake. But right now I am eating Donna Hay brownies and they are awesome. I like to think that the fact they're tiny means that they're not really cake. I don't know if that helps you... but there is a recipe for Donna's raspberry-spiked chocolate brownies coming shortly, just as soon as I wrestle the photo off my phone. They're sooooooo gooooooood *drools* They'll sit in the pan, calling "eeeeeeeeat meeeeeeeee" until you do. All of them. Unless you don't like raspberries, in which case you'll hate them.